Greenhouse gas emissions today are deadly pollution for tomorrow, ​but the main source of emissions, fossil fuels, emits deadly air pollution today. ​F. Perera 2017 Pollution from Fossil-Fuel Combustion is the Leading Environmental Threat to Global Pediatric Health and Equity. ​Continuing today’s patterns of carbon-intensive energy use is estimated, ​together with climate change, to cause 6 million deaths per year by 2030, close to 700,000 of which would be due to climate change. This implies that a combined climate-carbon crisis is estimated to claim 100 million lives ​between now and the end of the next decade. Today already committed (locked in) global climate change is a dire and terrible emergency for the future of today's children the world over. ​Childen of all regions are more vulnerable ​to all impacts of ​climate change on ​human populations a vulnerable sub-population). ​'Older and younger people are also especially sensitive to climate ​change impacts. ​Children's developing immune, respiratory, and neurological systems make them more sensitive to some climate change impacts, including more frequent or severe ​extreme events, ​increased heat, and worsened air quality.' (EPA). ​Children are dependent on other people.Children constitute ​roughly half of all persons affected by disasters. ​In 2007, Save the Children estimated that over the next decade, up to 175 million children worldwide will be affected by climate change-related disaster. Also, because atmospheric greenhouse gas levels and global climate change are now accelerating, with all impacts happening now and much faster than anticipated, and national governments are doing next to nothing about it, the generation of today's ​​children will grow up in an extremely dangerous climate. Among the impacts is increasing conflict and decreasing food security. A focus on children ​​is generally not included in global climate change impact reports and plans. The 2014 IPCC WG2 climate change impacts assessment for policy makers does not mention children or young people despite the fact that it covers vulnerability. ​​Children are not well covered by the IPCC assessment Summaries for Policy Makers . Increased vulnerability is recognized since the 1992 2nd assessment SPM, increasingly in the 200 3rd assessment. Scant recognition in the 2007 4th assessment SPM and none in the 2014 5th assessment SPM, despite the fact that research findings on children had greatly increased, and is included here. As the AR5 Health Chapter said In summary, we conclude that climate change will have a substantial negative impact on childhood undernutrition, particularly stunting; and on undernutrition-related child deaths the omission of children in the SPM is extraordinarily negligent. Though UNICEF is a top source of information and a search finds several ​​climate change children reports, UNICEF's site does not highlight the issue. UNICEF 2011 The benefits of a child-centred approach to climate change adaptation. This is essential right now, but without agressive mitigation at the same time is unlikely to have lasting benefit. Of cource children cannot adapt and the best adaptation is funding and upgrading of public health services. improve the evidence base, Yoko Akachi, Donna Goodman, David Parker. 400,000 climate change related deaths/year. UNICEF 2014 VIDEO What does climate change mean to children from around the world? ​Future climate change may bring disastrous increases in childhood diarrhea. ​2. Children are also most vulnerable to all impacts ​of global climate change, in industrially developed as well as developing countries. due to current and already committed greater degrees of climate change​. ​India, Pakistan, Philippines Bangladesh (in that order). Climate change will exacerbate ongoing causes of morbidity and mortality amongst children. ​UNICEF 2017 Levels & Trends in Child Mortality. The world has made substantial progress in reducing child mortality in the past several decades. Even so every year, millions of ​children under 5 years of age die, mostly from pneumonia, diarrhoea and malaria. In almost half of the cases, malnutrition plays a role, with unsafe water a signifcant factor. All of these are predicted to increase with global climate change​. Also huge disparities in under-fve ​mortality exist across regions and countries. children and climate change ​section. August 2nd 2016. ​UN Climate Secretariat report Climate Change Mainly Impacting Vulnerable Children. The top authoritative report. Gender The vulnerability of babies and small children is linked to the vulnerability of women in poor and developing countries, as they are the child bearers and main care givers, making this ODI 2011 review doubly relevant (Gender, generations, social protection & climate change: a thematic review. 2015 Plan Int. We Stand as One, includes consultations with children. 2017 UN Video Inspiring Human Rights Council on climate change and the rights of the child. 1.5C global warming safety limit, which is now the limit adopted by climate science. Children in industrially developed counties as well? developing countries and create new poverty pockets in countries with increasing inequality, in both developed and developing countries' IPCC 2014 WG2 SPM p. 20. This happening. The IPCC 2014 WG2 SPM reports: Impacts from recent climate-related extremes, such as heat waves, droughts, floods, cyclones, and wildfires, reveal significant vulnerability and exposure of many human systems to current climate variability (very high confidence). 'Impacts of such climate-related extremes include alteration of ecosystems, disruption of food production and water supply, damage to infrastructure and settlements, morbidity and mortality, and consequences for mental health and human well-being', which as affected 'countries at all levels of development IPCC 2014 WG2 SPM p.6 At already committed degrees of climate change all major food producing regions will suffer crop yield declines with food shortages to which developing children are most vulnerable. This has started. 'Based on many studies covering a wide range of regions and crops, negative impacts of climate change on crop yields have been more common than positive impacts' (high confidence) IPCC 2014 WG2 SPM p.4. 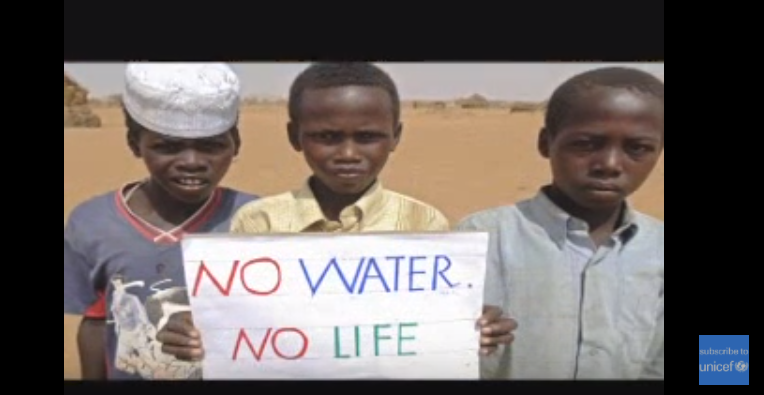 Children in all regions are most vulnerable to loss of water security. Communicable diseases have already started to spread from tropical regions to the more wealthy temperate regions, and new diseases are predicted has started, and in the future can affect all countries. Climate change is already increasing the number of refugees, with children most at risk. Climate change driven conflict (a cause of refugees) as long predicted is happening and in the future can affect most counties. 'Climate change can indirectly increase risks of violent conflicts in the form of civil war and inter-group violence by amplifying well-documented drivers of these conflicts such as poverty and economic shocks (medium confidence). Multiple lines of evidence relate climate variability to these forms of conflict'. IPCC 2014 WG2 SPM p. 20. Adaptation measures are essential to start working on for all countries, and mainly consists of upgrading public services, which applies to most if not all countries. Adaptation is least likely to benefit children due to their high vulnerability. Limits to adaptation emerge from the interaction among climate change and biophysical and/or socioeconomic constraints. As the IPCC 2014 5th assessment says: 'Opportunities to take advantage of positive synergies between adaptation and mitigation may decrease with time, particularly if limits to adaptation are exceeded. In some parts of the world, insufficient responses to emerging impacts are already eroding the basis for sustainable development'. IPCC 2014 WG2 SPM p. 20. 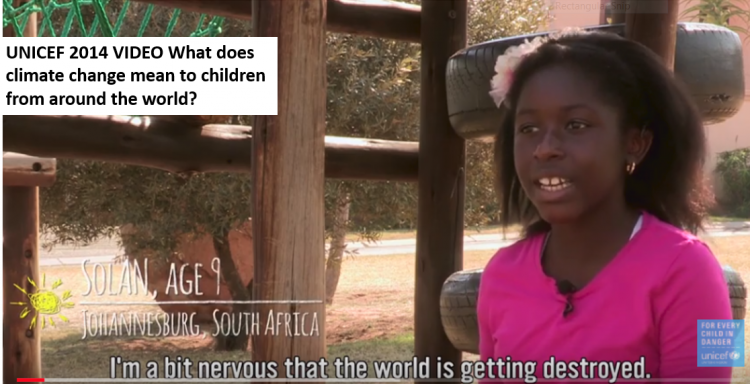 ​a question exists of whether today's children have a future worth living.